One thing almost everyone can agree on is that there never seem to be enough hours in the day and dollars in the bank. 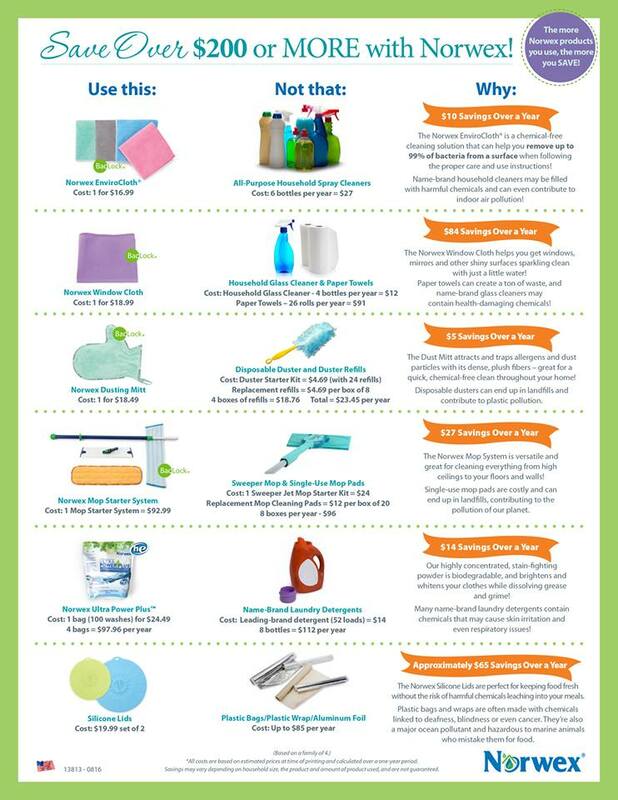 So when I started using Norwex, I was thrilled to realize I not only would be radically reducing the chemicals in my home, I also would be saving time and money every single day. 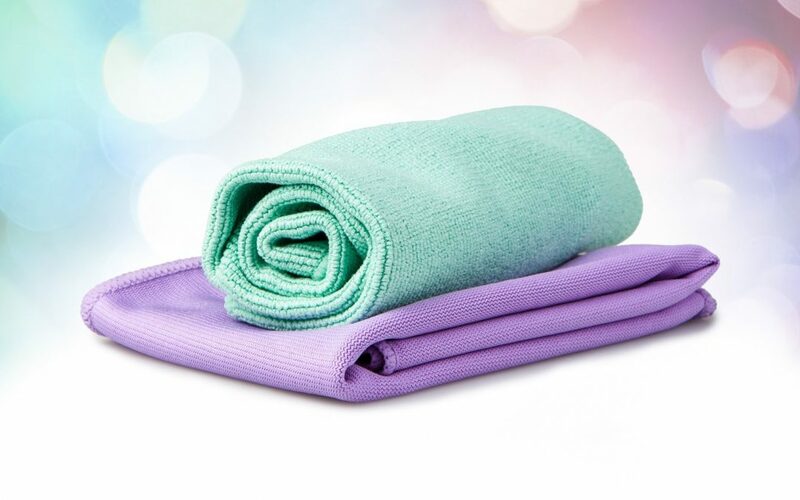 Just consider the Norwex Basic Package, which includes the EnviroCloth and Window Cloth. These two items alone can clean up to 90 percent of your home with just water. The EnviroCloth removes dust, dirt and grease from all washable surfaces and the Window Cloth makes windows, mirrors, glass, stainless steel and granite counter tops sparkle. They are my go-tos for everyday cleaning. I just grab them, move from room to room, wiping down surfaces — and voila — I’m done in under an hour. You might consider $34.99 (as of 8/17/17) kind of pricey for just these two cloths. But keep in mind that all Norwex microfibers carry a two-year warranty, and with proper care and use, many people clean with them for five years or more. Then, think about all the things you won’t need to buy ­– including paper towels, Windex, all-purpose kitchen cleaner, Pledge, bathroom cleaners ­– and what that means for your wallet. On average, in a year, consumers probably purchase about six bottles of all-purpose cleaner (around $27), four bottles of window cleaning solution (around $12) and maybe 26 rolls of paper towels (as much as $91, depending on brand). That’s about $130 that average consumers are spending each year on non-reusable products that will end up in the environment and landfills. Now, add that up over two, or even five years, and there’s no comparison to the $34.99 (as of 8/17) you spent on your Norwex cloths. When you start to save hundreds of dollars each year by not buying all those chemical cleaners for your home, it makes the value of the cloths much greater. You also won’t be carrying all those cleaning supplies around the house as you do your chores, which saves A LOT of time and energy! This is just one example of the cost savings you can experience with Norwex. (See the helpful flyer I’ve added below for many others.) We offer quality products for floors, laundry, kitchen and even your car and backyard grill that replace a host of household supplies that constantly need to be replenished. And, while my love for Norwex began with cleaning, I still find myself pleasantly surprised by the savings I’m also experiencing on personal care. Once I began using the Norwex Body Cloths, for example, I almost completely stopped buying soap. I only have to purchase my Crystal Deodorant every six to nine months, while I used to have to buy my store-brand deodorant monthly. So, when someone says “Norwex is too expensive,” I feel it’s only fair to share what I, and thousands of Norwex users, have experienced. After all, who wouldn’t want to save time and money, while purging their homes of potentially harmful chemicals and reducing the amount of waste going into landfills?